The story of a princess from a minor, obscure and impoverished German principality becoming the most powerful woman in the world is one of the most famous ones of history. 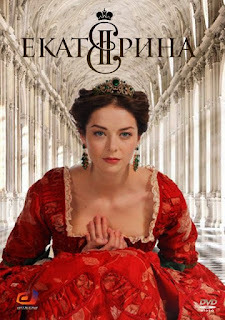 A 2014 Russian TV series entitled "Ekaterina" explores the story of the arrival to and first years of Princess Sophie Friederike Auguste of Anhalt-Zerbst in Russia and her becoming Empress of All the Russias as Catherine II following a coup d'état and the assassination of her husband, Peter III. Admittedly, my knowledge of Romanov history is limited to the basics and I haven't watched every depiction of the life of Catherine the Great, like the 1995 one, but this one was definetely good - and that's not just because of the amazing dresses, jewellery and palaces featured. Many of the characters are very nuanced, especially the one of Peter III in the early episodes. Historians have gotten beyond the point of seeing him just as a vile and evil character - and the show tries to portray that. Catherine also sees a real development of character thanks to the ten episodes though I wish the final year or so depicted in the series would have been drawn out a bit longer. Towards the end, everything seems a bit rushed with the death of Empress Elizabeth and everything that follows until Catherine is proclaimed Tsarina crammed into an episode and a half.